Scolt Head Island is a National Nature Reserve forming a part of the North Norfolk Heritage Coast. 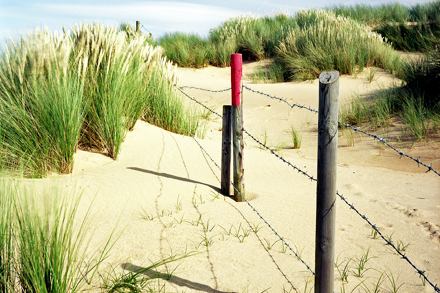 Designated an area of outstanding natural beauty it is jointly owned by the National Trust and the Norfolk Wildlife Trust. It is currently managed by Natural England. Technically speaking it is a barrier island that runs parallel with the coast. Comprised of saltmarsh, sand dunes, mud flats and huge areas of hard flat-sand beach, this area has a ‘wildness’ about it that is rare, if not impossible to find in other coastal plains of England. This is a very important wildlife conservation site and the difficulty of access and the island’s remoteness aid in this work. A large colony of sandwich terns raise their young on the island each year. Arctic, little and roseate terns also inhabit the area. Wintering wildfowl and many waders, including teal, curlew, shelduck and wigeon, with several other species that are permanent residents or seasonal visitors can also be seen. The saltmarshes in this area are said to be the finest in the UK. They have been thoroughly researched and studied over many years and are now the best documented of their type anywhere in the world. 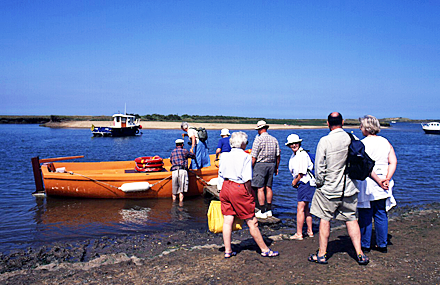 The pleasant hamlet of Burnham Overy Staithe straddles the A149 coast road between Brancaster Staithe and Holkham. If arriving by car turn at The Hero public house into East Harbour Way. At the bottom of the street you will see the entrance to the staithe where there is a large area of hard standing on which to park. If you intend to leave your vehicle unattended for most of the day do not park near the water’s edge if the tide is out. This seems obvious advice but every summer parked vehicles are partially submerged by the incoming tide at various parking spots along the coast. If you arrive around high tide you may well find that the ferry service to the island is running. This will get you out and back of course but your time on Scolt Head will be governed by the tide times. When the tide goes out it does so quite rapidly, as a result there is only a short time period during which the ferry can operate. Walking out to the island across the marsh at low water is possible but I would strongly advise against it if you do not know the area well. If the ferry is not running this does not present a problem, as there is an excellent alternative available that I in fact prefer. A promontory called Gun Hill lies just to the east of the island itself and can be reached quite easily on foot. The landscape there is just as beautiful as on the island so I prefer to leave the birds in peace and picnic in the dunes or on the beach near Gun Hill. The sands are exposed at low water when the sea retreats several hundred yards from the strand. There is never a problem with overcrowding; if you wish to be private you have hundreds of acres in which to hide. 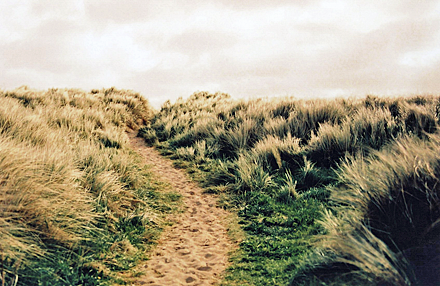 The Norfolk coast path runs from the eastern end of the parking area along a well-surfaced grass bank out to the beach and Gun Hill. The walk will take about 30 minutes and there is a boardwalk at the commencement of the dunes that makes progress less tiring. Walking along the bank at any time of year is a great pleasure. Perhaps not picnicking weather, but if you are lucky enough to be in a Burnham Overy holiday cottage over Christmas or New Year and you are a hardy type, try it then. The wind howls in off the North Sea; bracing it certainly is! If you visit in the summer aim for late July when the mallow and other colourful plants line the edges of the bank and the sea lavender is in full bloom down on the saltmarsh. To the inland side of the path you can see for a considerable distance across Overy Marshes towards Holkham; there will be cattle grazing on the lush grass. There is also a small lake fringed by reed beds with a variety of wildfowl and other seabirds in residence. One of the great pleasures of being in this environment is listening to the call and songs of the bird life – you will hear the plaintive calling of the oystercatcher and the song of the skylark. When you reach the dunes you can pick your ideal picnic spot or if you prefer go down onto the beach and set up camp there. If you are blessed with a hot summer’s day for your visit you will wonder why people queue at airports to travel to the Mediterranean resorts where they will share the crowded beaches with thousands of others. Enjoy your visit to Scolt Head Island or Gun Hill. For your Satnav (The Hero) PE31 8JE. Please watch the video. I hope it will give you a feel of the place. Yes you can. The outlet to the sea is too deep and the currents too strong at high water to cross. Can you get stranded on Scolt head island? Yes, but the currents can be strong and remember you are a long way from help if something should go wrong. Never swim there alone and I would suggest never go out of your depth. There are also areas where the sand is almost like quicksand. Enjoy but take care. Can anyone one help as to the swimming conditions at scolt head? Is it safe to do so? Presumably because of its commanding position overlooking the entrance to the channel. It seems likely that at one time a defensive cannon would have been sited there. Why is it called Gun Hill? The botanical name is Limonium but we always refer to it as Sea Lavender. Can you please tell me what the very small flower that grows in the mud-banks of the Scolt Island. It was in flower this weekend of early August ? It was quite widespread and gave a show of purple en masse. The flower is slim and bunched from the base of the stem. The flower stands approx 12 cm tall.